Let's talk about hummus. I am one of those people who looooves hummus. It is the food of the gods... it pairs perfectly with pita, crackers, carrots, red peppers, grape leaves & feta, avocados & turkey, Kalamata olives... the list goes on and on. This Hummus Crusted Chicken with Rosemary and Lemon recipe? Oh, holy amazing. While I prefer my homemade hummus (extra tahini & garlic with roasted red peppers and/or artichoke hearts), I pretty much always have a tub or two of store-bought hummus on hand. I've spent years trying various brands and while there aren't any that I really hate, there are a few brands that I'm not overly fond of (namely Athenos). Of course, there are also those that I really love: Sabra's Roasted Red Pepper Hummus, the Greek Olive hummus, and the Basil & Pesto hummus are my absolute favorites; Tribe's Zesty Spice & Garlic hummus isn't far behind. I also love the Roasted Lemon & Thyme hummus from The Love & Hummus Co., but unfortunately, it's only sold in California. Occasionally, I'll buy either the edamame hummus or the guacamole hummus from Trader Joe's (but I still think the avocado hummus I make is better). Today's LTP: How do you feel about hummus - are you a hummus fiend like me? Do you have a preference for homemade versus store-bought? What's your favorite brand and/or flavor? I have to agree with you on Sabra--they have so many delicious flavors. However, my absolute favorite is Trader Joe's cilantro & jalapeno. I could eat that by the bucketful! Your post caught my eye as I was enjoying my lunch of hummus and tabuleh on pita! 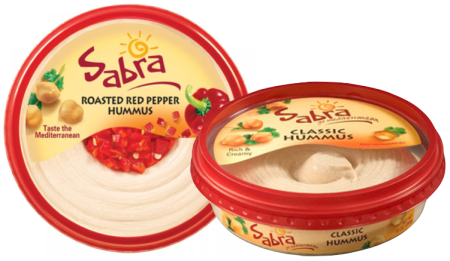 :) I used to love Sabra but we may have over done it and now I always taste something synthetic when I eat it (not so much the red pepper kind, but the plain for sure). My favorite store bought is hands down the Basha Premium Hommus that you can get at Costco in huge tubs. The preservatives in any store bought hummus sometimes irritate my kids skin (they usually wear as much as they ingest) but I don't make my own much anymore because it turns into an elaborate messy process that defeats hummus's convenience factor. I've also recently started eating hummus as salad dressing. I put a big dollop in the middle of the salad, then squeeze lemon juice over the rest of it. Very good! When I make my own, it never tastes right. I've tried several recipes and it is always blah, so it must just be me. Sabra is good. Whatever it is that I get at Middle Eastern restaurants (let's mourn Aladdin's, shall we?) is even better. But expensive, of course. Also, I've noticed that although you can skip the tahini if you can't find it, the tahini makes it more "hummus-y." When I make it, I use less chickpea liquid than what they call for and a little more olive oil or lemon juice. I used to think that I didn't like hummus because I was always served the store bought kind. In Denver, we have an awesome restaurant called Phoenician Kabob, where they make it fresh (meaning they get fresh chickpeas, cook them and then use them to make the dish), and I could eat that ALL day long it is SO good! I was even able to bribe the restaurant owner/head chef to teach me the recipe but haven't made it in a while. @weary prof: I'm back & forth on the cilantro/jalapeno hummus. I loved it the first time I tried it, but really didn't like it after that - the jalapeno way overpowered the cilantro, which made me sad. I should make my own cilantro hummus! @Aimee: I feel the same way about the classic Sabra; I love the flavors with mix-ins, but I think there's something weird about the plain one. I've never tried Basha Premium - I'm definitely going to have to check that out! Also, I get where you're coming from - hummus is a messy undertaking! That's exactly why I always have the store-bought stuff on hand. The homemade stuff is just sooo good though. @Jen W: I am still seriously sad about Aladdin's! Andies hummus is close (we'll definitely have to get some tomorrow! ), but not quite as good as Aladdin's (boo!). I agree with Kaitlin that you may need more garlic in your homemade stuff - it also might be the chickpeas (I've had some funky ones, which made the hummus taste really weird). @Kait: Definitely! I usually double the lemon juice because I want the strong flavors. Chickpeas are kind of blah on their own. @Jenny: The first hummus I ever had was Athenos and I really didn't know the difference at that point. Once I had the homemade stuff (made by Eric T @ Ripon! ), Athenos was out the door! I do like some of the store-bought ones, but really, they can't measure up to fresh homemade stuff. Love hummus and tahini both. Most store bought hummus brands are pretty good. Sometimes I think them out a little with lemon juice (try it) and it's my go-to dip for all veggies. I love to make my own hummus! Lots of extra tahini is the secret to making it creamy and smooth. Hummus from a local restaurant is my second favorite, followed by any of the Sabra varieties. There nothing better that homemade . Your avocado hummus is much better, totally superior! The Trader Joe's horseradish hummus is one of my most favorite foods EVER! I make my own hummus and I love to use the recipe for roasted carrot (roasted in whole cumin seeds but slightly crushed, garlic and olive oil) hummus. I make sure that I don't puree it too much(with tahini, olive oil and lemon juice) so that I've got little identifiable bits of carrot, garlic and the odd seed. It's so good that I could just eat it neat of a fork!! @Anita: That's an excellent idea... why didn't I think of that?! @Deb: Yes!! I love extra tahini - I realized that was the secret after I asked a local restaurant about their hummus (it was so amazing!) & they said they double the amount of tahini and lemon. @Anthea: Ooooh, thank you! That sounds so delicious!! i never tried hummus til college and it has changed my life! i even made a waffle out of it once!